How could they have just gone to their slaughter like that? HJ (Hollywood Jew): The Atlantic journalist Jeffrey Goldberg pointed out that many in the media tend to point out the disproportionate casualty count between Israelis and Palestinians, and he wisely wondered if there is a moral difference between attempted murder and successful murder. BM (Bill Maher): It’s obvious that Israelis, in all of their battles with the Palestinians, show restraint. Because they have nuclear weapons. And if the situation was reversed, I don’t doubt for a second that Palestinians would fire them immediately. They’d use the maximum of what they have available and the Israelis don’t. HJ: There was a big debate this week in the Jewish world that arose from a dispute between two rabbis about whether Judaism should be more universal and humane or more tribal and self interested. But it is widely felt that the Israeli army conducts itself with deep concern for the humanity of the people they are fighting. BM: Let’s not forget the other side of this issue, which is, the Palestinians do have gripes, and most Israelis do not agree with the Netanyahu government on the settlement issue. [Israelis] want a two state solution. I don’t think anybody’s ever gonna be happy or the conflict will ever end before that happens and as many writers have pointed out, Israel faces the problem of becoming a minority Jewish state within their own country if they allow this to keep going. There has to be some solution. In a lot of ways, what we see in Israel is their government has been taken over by the equivalent of what would be the Tea Party in this country. If you talk to most people in Tel Aviv, I don’t think they’re for what the government is doing, but when it comes to self-defense — Obama himself said the other day: There’s just not another country in the world that would allow missiles to be rained down on them without fighting back. What I find so ironic is that after World War II, everybody said, ‘I don’t understand the Jews. How could they have just gone to their slaughter like that?’ OK, and then when they fight back: ‘I don’t understand the Jews. Why can’t they just go to their slaughter?’ It’s like, ‘You know what? We did that once. It’s not gonna happen again. You’re just gonna have to get used to the fact that Jews now defend themselves — and by the way, defend themselves better. I mean, this is a country, after all, that is surrounded by far greater numbers than their own [and] they are like two generations ahead in the military technology they have. HJ: Considering the reality of an unstable Middle East, an Iranian nuclear threat, a stalled peace process and a civil war in Syria, what’s the best thing Israel can do to engender moral support from the international community? BM: I think they’re over worrying about international goodwill. I hope they are, because it’s great to have but it doesn’t really feed the bulldog, you know? As my Jewish mother used to say, whenever there was a problem in the world, she would go, ‘Oh I know they’re gonna get around to blaming the Jews.’ [Laughs] And it’s kinda true. I mean, you know, it’s like somebody who’s always worrying whether everyone’s gonna like them — Obama kinda had that problem in his first term — but at a certain point you learn: You know what? A lot of people are not gonna like you no matter what you do, so just do what you’re gonna do. Just be yourself. And do what you think is right. And if they condemn you or hate you, that’s really kinda their problem. Danielle Berrin writes the Hollywood Jew blog, a cutting edge, values-based take on the entertainment industry for jewishjournal.com. A Los Angeles Times profile dubbed her ‘a natural born provocateur’ for her commentaries on the business, culture and characters of Hollywood. Her work has appeared in The New York Times, The Guardian, British Esquire and The Huffington Post. NOT AN EASY NUMBER TO FIND. Darfur Death Toll: from 100,000 – to 400,000. Total number of children tallied from the above? God knows. And maybe even he doesn’t know, spending all that time in eternity he could have lost count. The following reporting, though it dates 2006, is currently replicated day to day in Sudan. If you read nothing else about Africa’s chronic pain read this. It covers a lot of ground and time in a short trek. You’ll get the picture, all you need to know. I close my eyes and I see them. The girls I met on a recent NBC News assignment in Chad are in my dreams. I think about what they have seen. I worry for their continued safety. In the picture above, you see everything that they have: Dirty clothes. Streaked faces. Each other. Their names are Samiyah, Safiyah and Gamara. 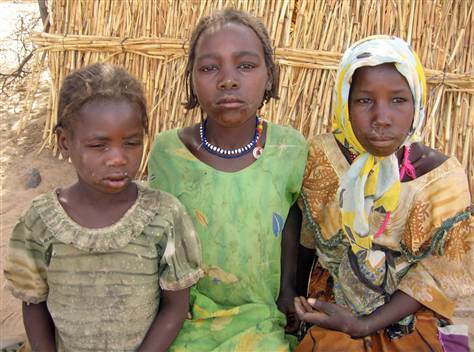 They live near the killing fields of Darfur. But they are not Sudanese. They are Chadian. Their only crime was an accident of geography and the color of their skin. The genocidal monsters of Sudan have changed everything about their lives. Starting with their mother and father. The village of Gongour in Eastern Chad is a 200-year step back in time. Families wake up under thatched-roof huts over mud floors. Children ride donkeys on their way to the communal water well. Other children are assigned the day’s other major task: finding firewood for cooking the evening meals. The children sometimes walk for miles with huge bundles of firewood on their backs. Most of them have never experienced the modern luxuries of a hot water shower, their own beds, refrigerators or a Western toilet. There is schoolwork for the boys, but not always for the girls. Each day has its own hardship, but there is always a great sense of community. The girls are Masalit, descendents of the harsh southern Sahara desert tribe. To reach them, one must travel to one of the most remote, dusty spots on earth. Our journey begins with a plane ride across the Atlantic to France. Another five-hour plane ride from Paris to the Chadian capital of N’Djamena. Transfer to a United Nations relief flight from the nation’s capital to the regional capital of Abeche. From there, it’s a torturous drive over tracked dirt that passes for a highway in Chad. It’s a four-hour drive to the eastern trading post of Adre. In my time in Chad, I saw two concrete roads. Both of them were runways. Adre is tense. A cross-border raid in January brought most of the government’s troops back to defend this vital crossroads. Army tanks routinely run through town, kicking up huge amounts of dust. Toyota pickups are filled with young, eager faces holding onto AK-47s. In the countryside, the Sudanese militias step into the power vacuum. The villagers are defenseless. War seems imminent. The drive to Gongour is still another three hours from Adre. It is easy to see into Sudan for most of the drive. In most other countries, the road would appear to end in Adre. But in Chad, the drive continues over tracked desert that feels like driving on the beach. We drive past women and children loading up donkeys with firewood and the occasional camel herd. We drive past many thatched-roof villages. During the day, it looks empty but there is much humanity here. Thousands of Africans live in these conditions, as they have for centuries. In short order, the tranquil African countryside gives way to more ominous signs. Kilometer after kilometer of empty villages. Where are all the people? We arrive at the village and look for the local sheik. Small, dirty children instantly surround us. They follow us everywhere. We are told of the nearby village of Ajani that was recently burned. The sheik rides with us to the site, about five kilometers farther south. He warns us to be quick, as there are many Janjaweed still around. As soon as we arrive, we realize we are stepping on hallowed ground. An utterly lifeless village transmits the horror. Several charred holes confirm it. Each piece of ash, each burned pot, each hole was the cornerstone for a family. On a cool February morning, just two weeks ago, the first sign of trouble comes from a distant sound. Horses running fast. It’s unusual in the hot desert at any time. But for Chadians, it may be the worst kind of warning signal. It jolts a primal instinct like no other. It the sound of Janjaweed — rebels from Sudan. Most stories are impossible to confirm, but they are all remarkably consistent. Thousands of refugees, many hundreds of miles apart, tell the same story. The Janjaweed ride into town on stolen horses. They wear khaki uniforms and turbans. The villagers run for their lives, but not all can get away. The Janjaweed catch many. They pull everyone out of hiding places. They kill all of the men first. A quick, but ruthless, execution. They are called Nubi, similar to being called the “N” word in our country. They are told that this harsh no-man’s land no longer belongs to them. It belongs to Arab Africa. Next, they take the mothers. Often times, they force the kids to watch a slow, painful torture replete with the worst kind of violence against women, who are tied spread-eagle and gang raped repeatedly in front of their children. In an instant, they are traumatized for life. When they are able, the survivors run for their lives and retreat to nearby villages. They know no one. Thankfully, the orphans are not split apart. In interviews, we find these girls have not eaten in days. There is no ability to gather food. They are staying with strangers without any family. Alone, but they have each other. This is the story of Darfur. The Sudanese government, alongside the Janjaweed militias, is systematically killing all black Africans in this area. First in Darfur, now in Chad. The Sudanese government is complicit in this ethnic cleansing when it uses its helicopter gunships to mow down anything that moves through the village. The villagers have remnants of bomb fragments that they show us. As I take their picture, I think of my own two children, safe and sound some 8,000 miles away. I think of the nights I spend reading to my 8-year-old daughter. We love the American Girl story of Samantha and her friend Nellie. Nellie and her two sisters were orphans, too. Three girls alone in the world with only each other to hold. The African girls are strangers in a village teeming with refugees. They have no food and no parents. I scan my brain to think of some way to take these kids with me, just like Samantha and Uncle Gard. Yet I’m resigned to knowing there will be no rescue for these girls. It would be an impossible legal nightmare even if the tribes would allow it. What can be done? Beyond the stories of traumatized children, there must be something more to it. Just giving voice to a powerful story is a good start. When friends and family ask why we go to dangerous places, my stock answer is: It’s a powerful thing to witness courage, to witness bravery. It’s an honor to tell their stories. Here are children who have almost nothing left in the world. And yet they show us the face of courage and their bravery to face each new, unpredictable day. Most of all, they are trying to hold a family together. Their mother must be so proud. Two hungry children in Sudan’s Nuba Mountains, sleeping inside a cave for protection from government bombers. PERHAPS hundreds of thousands of people here have no food and are reduced to eating leaves and insects, as Sudan’s government starves and bombs its own people in the Nuba Mountains. Children are beginning to die. “Yes, my children may die,” Katum Tutu, a 28-year-old mother, told me. She recently lost her 2-year-old daughter, Maris, to starvation and has nothing to feed her four remaining children. “I think about it every day, but there’s nothing I can do,” she said. This week will mark a year since Sudan began its brutal counterinsurgency campaign in the Nuba Mountains, intended to crush a rebel force that is popular here and controls much of the region. Sudan has expelled aid workers, blocked food shipments and humanitarian aid, and dropped bombs haphazardly — and almost daily — on its own citizens. Sudan bars outsiders, but I sneaked in from South Sudan on a dirt track controlled by rebels. Since my last visit, in February, the situation in these areas has deteriorated sharply: a large share of families have run completely out of food, with no prospect of more until the next harvest in November. Ryan Boyette, an American aid worker who stayed behind when foreigners were ordered to evacuate, estimates that 800,000 Nuba have run out of food in South Kordofan, the state encompassing the Nuba Mountains. 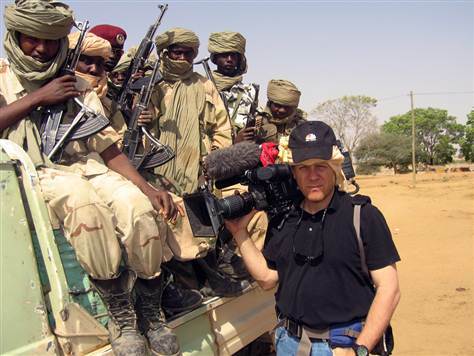 Boyette has created a local reporting network called Eyes and Ears Nuba, and the Sudanese government showed what it thinks of him when it tried to drop six bombs on his house last month. The notoriously inaccurate bombs missed, and he escaped unhurt in his foxhole. Katum, the woman who lost her daughter, was typical of the dozens of Nuba I spoke to. Like many here, the family has been living in caves for most of the last year to escape bombs, and it ran out of the local food staple, sorghum, a few months ago. Families are also eating beetles and wild roots, but their diet today is mostly the newest leaves of three kinds of wild tree. New leaves are stripped bare from trees near villages, and you see children climbing high on thin branches to try to find new leaves that remain. I also came across small children, sometimes just 2 or 3 years old, digging in the ground for edible roots or seeds that they popped in their mouths. Some 50,000 people have fled their homes and are trekking to Yida, a refugee camp just across the border in South Sudan. But many I spoke to, Katum included, say they just don’t have the strength to walk for days to get there. At that point, our interview was interrupted by a humming overhead: an Antonov bomber, flying unusually low. Katum scrambled off, seeking a cave in case a bomb fell. Antonov and MIG warplanes regularly fly over these rebel areas, dropping bombs without any apparent purpose other than sowing terror. Fear of them has kept people from farming and is a main reason for the food shortages. Some farmers are now planting their fields as the rainy season begins. They can harvest in November and will have to get by on leaves until then. Many other families, including Katum’s, ate their seed stockpile in hopes of keeping their children alive. So for them, the only hope is humanitarian aid. Considering how many people are subsisting on leaves, perhaps the surprise is that the death toll isn’t higher. In Katum’s village, Famma, elders told me that about 40 people had starved to death in the last month, out of a population of thousands. Among children arriving at the Yida refugee camp, about 10 percent are acutely malnourished, according to Samaritan’s Purse, an aid group assisting the refugees. World leaders are mostly turning a blind eye. There isn’t even serious talk about damaging the military airstrips that Sudan’s warplanes take off from before dropping bombs on civilians, or about forcing a humanitarian corridor, or about arranging airdrops of food. As a result, the only certainty is that many Nuba will starve to death in the coming months. President Obama, you harshly criticized President Bush for failing to stand up to Sudan’s slaughter in Darfur. So now what are you going to do as Sudan kills again — on your watch?